With our friend Fabrice and his mother in Dusseldorf. This summer, my wife and kids and I did something that was literally a dream come true: we spent a month traveling internationally as a family in Europe. We went to Dusseldorf, Germany, Prague, London, Glasgow and Madrid. 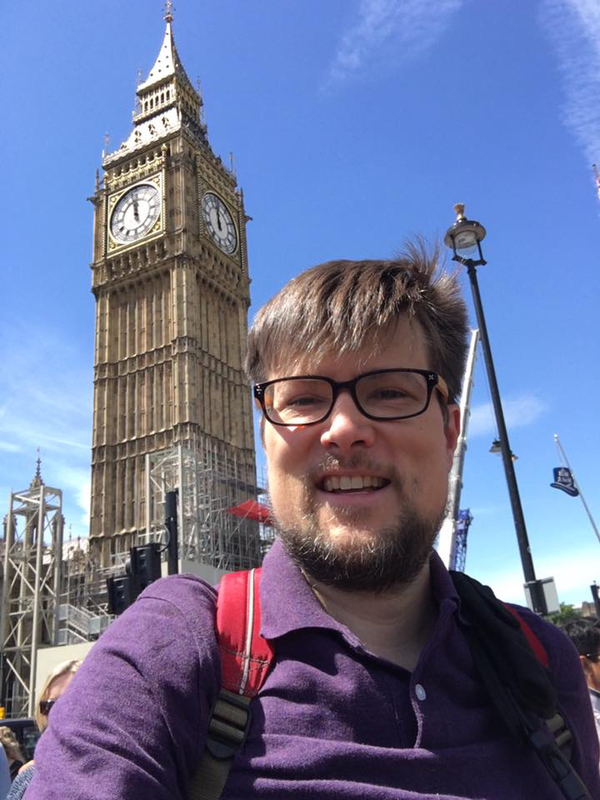 My wife and I used to talk about this, years ago: “maybe someday we can travel with our kids to other countries.” We have wonderful friends all over the world, from Tokyo to London to Scotland and Prague, who we wanted to go visit, and we wanted to do it once the kids were old enough to be good travelers and enjoy and remember the trip. So this year, we decided to take the plunge and spend the money and go for it. We had friends in Dusseldorf and London who were offering us several weeks of free lodging; we had other friends in Prague and Scotland who wanted to show us around, and we found some affordable tickets on Iberia Airlines (the national airline of Spain) that made it financially feasible to fly all four of us to the other side of the Atlantic and back. We are very lucky in that we have an unusually flexible lifestyle, because I’m a freelance writer who can work from anywhere with WiFi, and my wife is a stay-at-home mom. And we happened to have a whole month free in June-into-July where the kids didn’t have school or summer camps or activities, so we decided to just go for it. 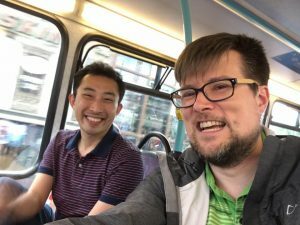 So from June 2-July 5, we left the country and stepped out of our everyday life. 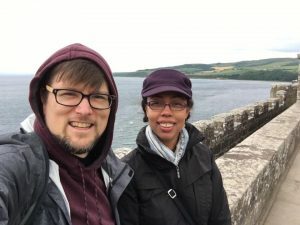 We spent a whole month away from America and away from home and we just soaked up the experience of living in Europe and seeing the sights and trying on a different way of living. And I’m happy to say that the trip was somehow even better than we’d imagined. 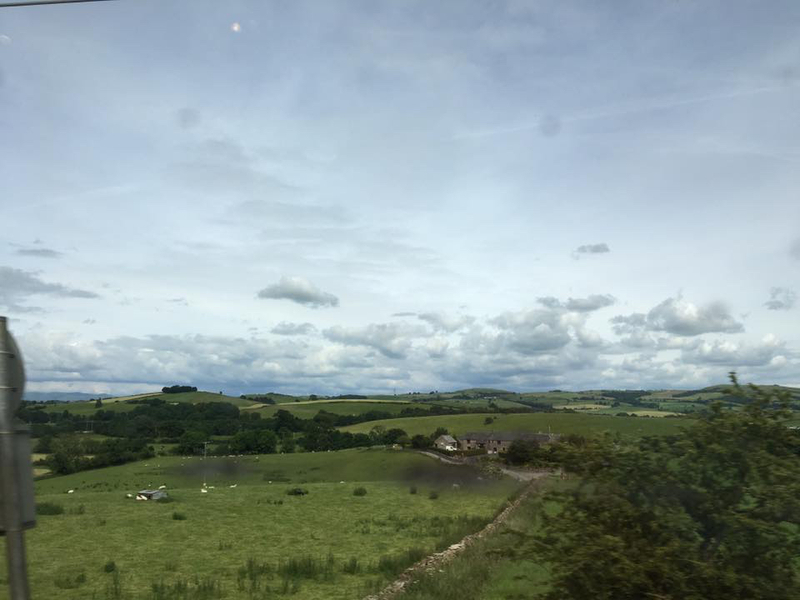 Beautiful countryside on the train from London to Glasgow. If you want to travel abroad with family, but you’re not sure if it’s affordable or feasible, or you’re not sure if it’s worth the effort and stress and sacrifice, I’m here to encourage you: GO FOR IT. I can’t believe we ever considered NOT taking this trip. The good feelings from our month in Europe have lasted for many more months. It gave me a whole new outlook on life and a whole new appreciation for our family, and it was a priceless investment in giving our children some irreplaceable memories and a more expansive sense of belonging. 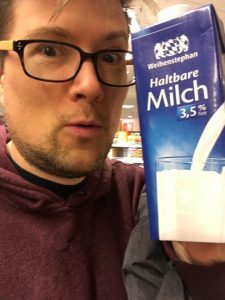 Plenty of good Milch in Germany! 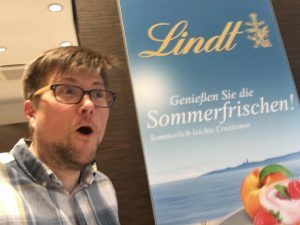 Shopping for Groceries: Grocery shopping in Europe is an adventure! We had so much fun just doing the mundane things like walking to the shops and carrying groceries home in a backpack. The kids enjoyed being helpful and reading the different labels on all the food. We ate a lot of meals at restaurants but we also ate lots of quick, easy dinners prepared “at home” in our friend’s apartment in Dusseldorf, or got easy takeout meals from grocery stores like picnic lunches of sandwiches and crisps at Tesco (one of the UK’s largest grocery store chains). It’s easy to eat cheaply when traveling internationally with family, and the thing is – the money you’re spending while traveling isn’t all “new money.” You were already going to spend lots of money on food and entertainment just being at home. Traveling internationally is not cheap, but with a bit of planning and effort, it doesn’t have to cause much more of an expense (beyond the airfare and lodging and tourist experiences) than what you’re already spending to just live life in your own hometown. Our regular old “boring” life in America is pretty expensive already! The boys kept busy without TV in Europe. One of the best parts of international travel with family is that it shows you just how little stuff you need to be happy. I lived out of a suitcase and a laptop bag for over a month and I was totally satisfied; I didn’t miss any of our stuff, or our house, or our cars. (And we love our house and neighborhood! But still.) 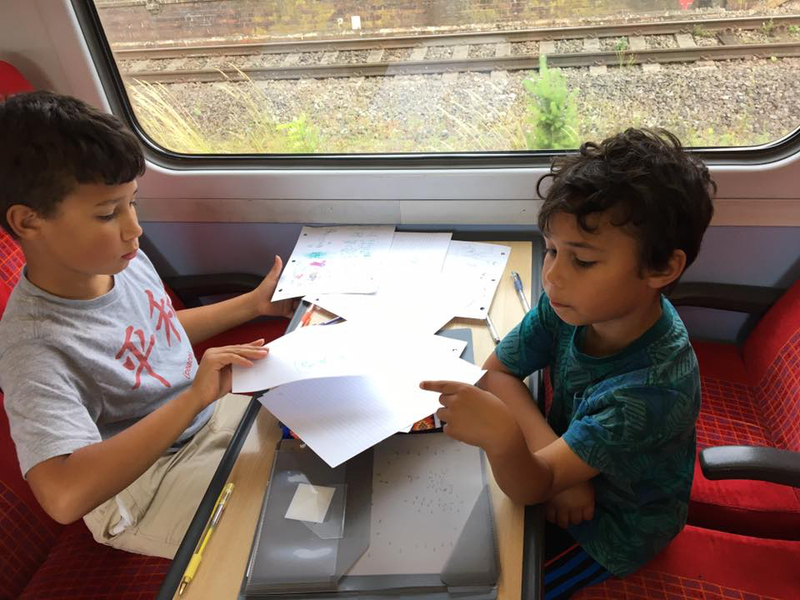 The kids were happy with just a few things – a suitcase of clothes, their little Kindle Fire tablets, books and card games and papers to draw pictures on the train, and a soccer ball that we bought in Dusseldorf. We lived a simple, carefree life that month in Europe! We walked everywhere, we didn’t drive a car the whole time, we played at parks and explored green spaces and hiked up a majestic hill near the Rhine River called “Drachenfels” (Dragon’s Rock – there is a mysterious medieval ruin of a castle at the top of this hill, that looks as if it was blackened by Dragon fire, with a restaurant with big windows where you can see for miles overlooking the Rhine River valley). 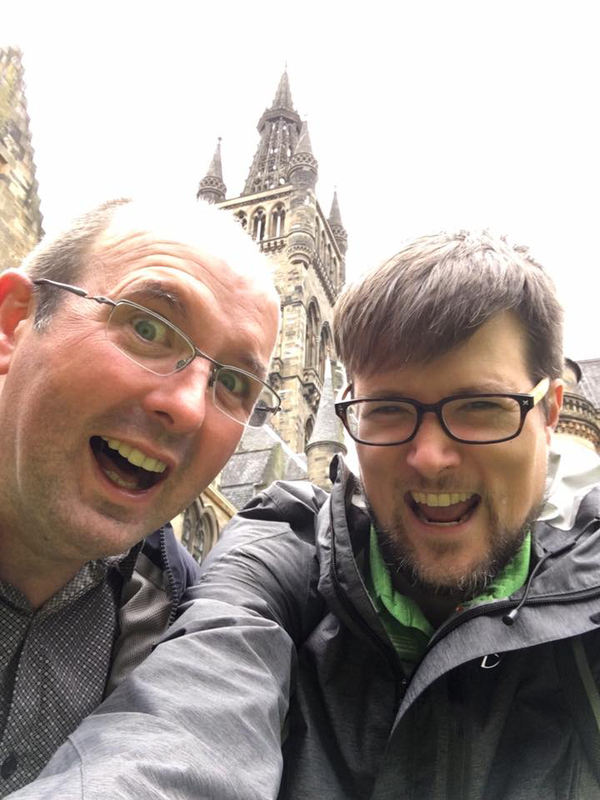 We participated in a digital simulation of the Battle of Bannockburn and then had a picnic lunch on a rainy day with our friends in Scotland next to the William Wallace monument, a gorgeously imposing place that I had seen on Wikipedia years ago and had dreamed of visiting. 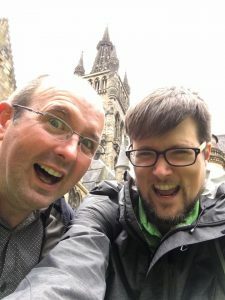 We walked the grounds of gorgeous Scottish castles and heritage sites, and visited the Making of Harry Potter: Warner Brothers Studio Tour in England (which was a really expensive money-sucking tourist trap BUT was TOTALLY WORTH IT). We took a boat ride on the Rhine River, we rode the London Underground and Prague trams and Deutsche Bahn trains, and it was all marvelous; the kids were in heaven, just having new experiences every day and seeing new places and meeting kids in other countries. Stuff doesn’t matter. Experiences and relationships and memories are all that counts, that’s all that we’re left with in the end. I was afraid that traveling internationally with the kids might be too stressful – what if they were homesick, what if they got overtired, what if we got on each other’s nerves from being in too-close of quarters for too long, what if I couldn’t get any work done and we ran out of money and the trip ended up being more trouble than it was worth? 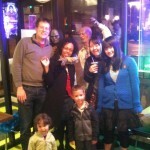 The truth could not have been more different: if anything, this trip helped bring us closer together as a family. We had a wonderful sense of togetherness from living in smaller spaces for a month. We spent lots of time together and watched almost no TV. We loved living in walkable neighborhoods and taking public transit. I felt like we had more time to just enjoy being together as a family, without the time-crunch and clutter and stress of our usual routine in America. (And we have quite a nice life in America, by American standards, but still.) I took the boys out for lots of gelato and they made me lots of coffee in our friend Fabrice’s Nespresso machine (after we got home, we even bought a Nespresso machine of our own; it’s the perfect souvenir, and every day when I’m making myself a coffee in the morning, I feel like I’m back in Europe). Most of all, this experience of international travel with family made us feel like more of a team. The kids (age 9 and 7) are good little travelers; they enjoy wearing their own little backpacks and pulling their own wheeled suitcases through the airport. 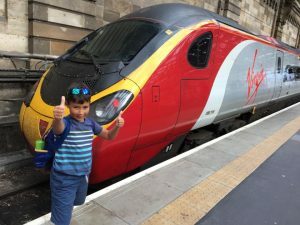 They love flying on planes, they love riding on trains, they were really open to the whole experience and we had very few moments of stress or unpleasantness. Your kids can handle more than you might expect – they will probably even thrive on the new experience and getting away from home for awhile. This trip was also a valuable learning experience for me, because one of the things I’ve struggled with as a parent, watching my kids grow up, is the fear of “losing” my kids as they get older. I sometimes miss the days when they were small and snuggly, even though of course there were lots of things about that stage of life that were exhausting and messy and stressful. But I worry about losing my kids as they become teenagers, I don’t ever want to feel like they’re slipping away from me, that they hate me or are indifferent to me, that they don’t want me in their life, that they become vulnerable to falling in with the wrong friends or making bad choices that will ruin their life. I sometimes have wondered, will our family ever feel as close again as we did when the boys were small, when we slept in the same big bed, when I read them sweet little bedtime stories every night? Am I already losing them? Harry Potter Studio Tour! The kids were in HEAVEN. TOTALLY worth it. America really isn’t the best place to raise kids. (No seriously, the U.S. ranks 19th in the world for best places to raise kids – lots of other countries do a better job of caring for and educating young people than America does; America treats “raising kids” like just another lifestyle choice to be privately funded, not a societal concern worth investing in. We spend more putting our troubled kids in prison than we spend on children’s education and health care.) Life as parents in America often feels frenetic and stressful and atomized; we so rarely see our friends here, everyone’s too busy on the nonstop slippery treadmill of individualistic American life. So why not move? Why not travel? Why not just spend as much time as we can with people we love, whether or not those people are family or fellow Americans? London and Prague of course are amazing, rightfully beloved international tourist destinations and I could write a book about each of those cities, and Glasgow and Scotland were friendly and charming and hauntingly gorgeous – I had wanted to visit Scotland for years and it was a dream come true, but Dusseldorf is underrated and we had a fantastic experience there as well. Dusseldorf was a surprisingly livable, comfortable, prosperous, diverse, hospitable, international city, full of sidewalk cafes and authentic Japanese restaurants where I got to speak Japanese with the staff (Dusseldorf is home to one of the world’s largest Japanese communities outside of Japan). Out of all the places we visited as a family, I think we could most readily see ourselves living in Dusseldorf. And everywhere we went, we loved the food – we had some of the best Indian food and Chinese food of our lives in London, and we had some amazingly inventive Vietnamese fusion and vegetarian cuisine in Prague, and of course plenty of delicious authentic German food, but even when we weren’t eating at “nice restaurants” we never had a bad meal the whole time, not even when we were eating cheap sandwiches and bags of crisps from UK grocery stores. Hiro and me! Friends since 2001. That’s right – we had to take our kid to a hospital ER in London, and we didn’t have to pay ANYTHING for it. It was FREE. 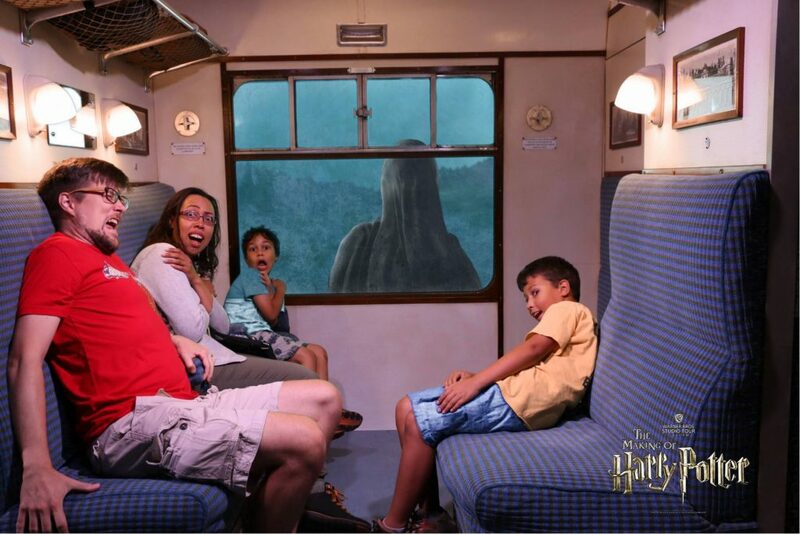 We were AMAZED. It was like we had just witnessed a David Blaine magic trick, but without the creepiness – we got FREE HEALTH CARE in the UK and we’re not even citizens there; we had better health insurance as “illegal immigrants” in London than we do in our own stupid country where we pay $1,000 per month out of pocket on health care costs. Can you imagine if foreign tourists had to go to a hospital ER in America, with no insurance?? That story would end in bankruptcy and deportation! Not even “real Americans” can get affordable health care most of the time in America. 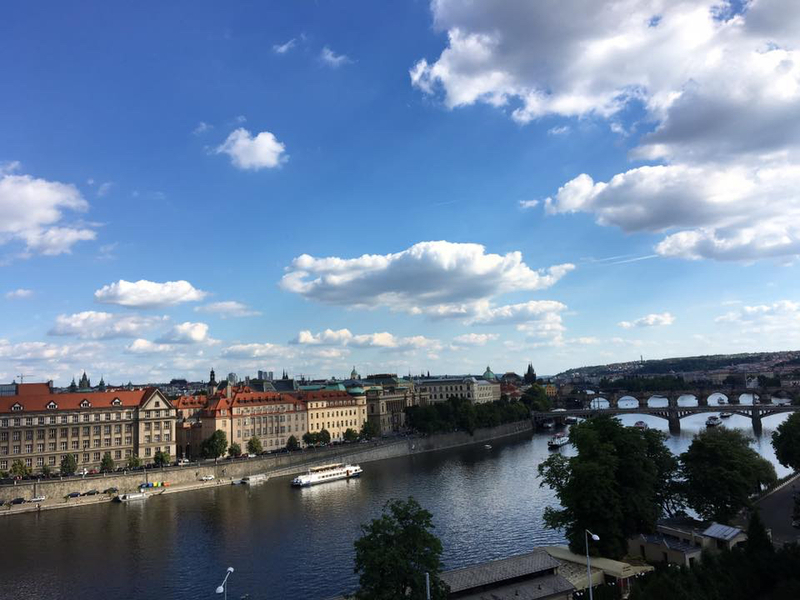 Prague. City of overwhelming beauty. Europe has more of a social safety net, and you can feel it. People there seem to have more free time, more space, more sense of enjoying everyday life, even simple things like drinking beer in the park in Prague. People there live life with less fear and a greater spirit of interdependence. Life in Europe just feels a bit more comfortable and communal, and less isolating and precarious, and no, it’s not just because we were “on vacation.” Yes, Europe has its problems and I don’t mean to say that Europe is unequivocally “better” than America; Europe has its racism and its xenophobia and its peculiar arrogances and insularities. But in lots of important ways, life just feels a bit easier and more family-friendly there. Sure, you have to pay higher taxes in Europe but you also never have to worry about going bankrupt from medical bills or getting murdered in a mass shooting or dying in poverty. Everyone has health care, no one has guns. 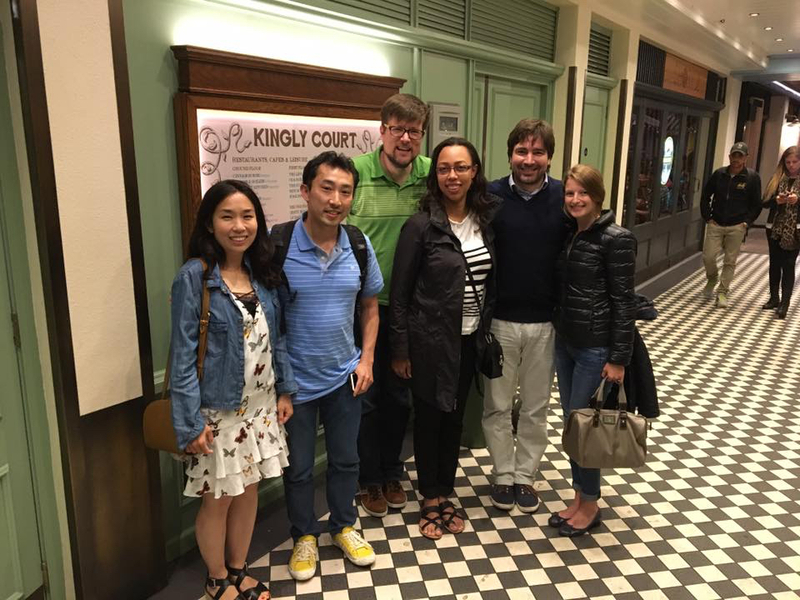 “Date Night” in London with Nanae and Hiro, Fabrice and Luise. What a wonderful night! The older I get, the more grateful I become for my friends. 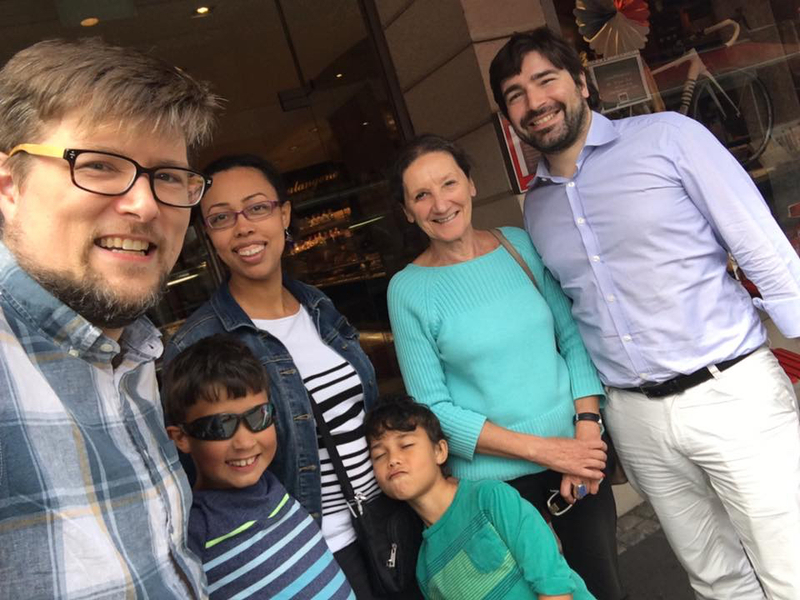 We have wonderful friends in Europe: Fabrice and Luise in Germany, Justin and Melanie in Prague, Iain and Kathryn and their son Alex in Scotland, Hiro and Nanae and their kids in London, who truly made this trip possible. I’ve been friends with Fabrice since high school – he was an exchange student from Germany at my school when we were 16 years old; I’ve been friends with Iain since 1999 when he was living on my dorm floor at Iowa State, and I’ve been friends with Hiro and Nanae since 2001 when we all met at Rice University; I am grateful to have been able to keep in touch with all of them over the years because of Facebook – and in fact, I ONLY know Justin and Melanie because of Facebook. I recently hired a business coach to get some “career therapy” to help me clarify some things about what I’m doing with my work as a writer and what I want my next steps in my career to be, and I have come to realize that my purpose in life, my “mission,” is this: I am here to build relationships with writing, and to try to make the world a smarter and happier place. I just want to spend the rest of my life doing the same things that this trip was all about: building relationships with writing, being in a community of good people all over the world, and spending time with the people I love. This trip felt like the culmination of a lot of things that I’ve been working toward and caring about and hoping for, over many years. I’m so glad we did it! I can’t believe we ever considered NOT doing it. This is the kind of trip that people regret NOT taking when they’re on their deathbeds. I wish everyone could have the equivalent of this trip in their life – whatever that means to you, whether it’s some goal you want to achieve, or some experience you want to have, or some big move you want to make. DO IT. Lots of Americans are feeling stuck and trapped and helpless right now. Too many people feel like life is a treadmill that just keeps speeding up, and they feel held back from really doing what they want with their lives or really being able to reach their potential. I know that I’m very privileged and fortunate and lots of people don’t have my advantages in life; I’m sorry for that. But I also believe that most people are not really as “stuck” as they might think. If there’s some new experience you want to have in life, if there’s some massive change you want to make in your life, whether it’s quitting your job or starting a business or even moving to another country, I really hope you will go for it. We dreamed of taking our kids on an international trip, we dreamed of seeing London as a family, we love and value our international friends and we wanted to stay better connected with them, and we decided to take the plunge and go for it. Hell, maybe we’ll go back to Europe next year! 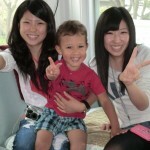 And we’re not done having international travel adventures as a family – we’re going to Tokyo later this month! This entry was tagged international travel with family, travel with kids. Bookmark the permalink.